A few things in our industry still puzzle me. For example, large submersible installations are major investments. You’re talking tens of thousands of dollars, sometimes for the 6- or 8-inch motor alone. Besides, these installations are not exactly on poly pipe that a couple of guys can wrestle out of the ground; it’s a major operation to pull and replace one. On top of that, many are in critical agricultural, municipal, or industrial applications, where not having water has major economic consequences. The mystery to me is why so few of these applications have any type of protection beyond basic overloads. The vast majority simply don’t, and that just makes no sense. If there was device that could protect your motor, why wouldn’t you use it? 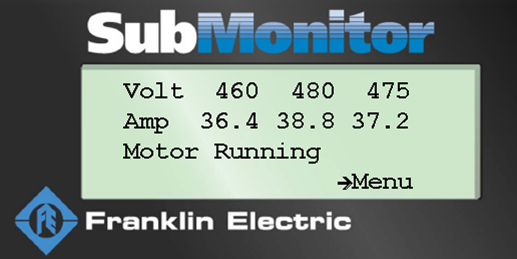 Franklin Electric offers SubMonitor to do exactly that, but there are others out there as well. Nothing is better at delivering groundwater than a submersible pump, but it can face a tough environment. Water tables can drop unexpectedly, end-users sometimes over-pump their wells, and electrical power, especially in rural areas, can be unreliable and cause damage to motors. The attached picture taken with an infrared camera tells explains perfectly and tells a terrific story. The hot spot you see is a loose fuse on the high voltage side of the transformer. Franklin Electric was called out to explain why the SubMonitor kept mysteriously shutting the motor down due to 3-phase unbalance. The power company maintained that everything was fine, and it actually looked that way initially. It was only after a few hours of operation (and when everyone had left) that the fuse connection got hot enough to cause the unbalance. Without a SubMonitor installed, the motor likely would have failed and been replaced, and then the new motor would have failed. My guess is that without SubMonitor, it would have taken at least a couple of motors, and the subsequent pulling and replacing of those, before the real problem would ever have been discovered. A critical point is that the contractor had done everything “by the book” here. SubMonitor, or any other device, can’t protect the installation against everything that can happen, but there’s no better way to reduce your risk for the amount of investment. On a percentage basis, the cost of a SubMonitor represents only a small percentage of the value of that installation and the water it provides to the end user. And as in this scenario with the loose fuse, the returns can be huge. The first time a SubMonitor saved the motor in that installation, it paid for itself many times over. Sometimes the best investments aren’t the products themselves, but the products that protect them. This entry was posted in Uncategorized and tagged groundwater, large installations, motor protection, overloads, submonitor by markreeder. Bookmark the permalink. target will be unaware with regards to a coming close to seeker. You ought to be in your deer stand or searching blind before daybreak.